Do you remember back in the 90s, when high-definition TVs first started to become popular? Seeing that HD for the first time, the sharpness seemed almost impossible compared to existing technology. But this year, several top tech companies showed off 8K screens with 16-times as many pixels as those old 1080p HD TVs. For me, seeing these new super sharp TVs at the Consumer Electronics Show (CES) felt like the first time all over again. Sony brought the most mind-blowing screen to Las Vegas. This 8K prototype TV isn’t just noteworthy for its resolution. It’s also extraordinarily stark with a display that puts out peak brightness levels of 10,000 nits. Nits are a unit for measuring brightness, and the study group that established standards for high-dynamic range (HDR) and DolbyVision determined in 2015 that 10,000 nits should represent the upper limit for display brightness. Beyond that, the researchers suggested, the human eye can’t really appreciate any more benefit. That would mean that this new Sony 8K prototype is as good as it gets. There’s no word on if or when Sony will bring it’s ultra-bright display to market. It’s also worth pointing out that the company showed it off by playing custom content in a dark room where viewers could only look at the screen directly. So who knows how close to finished the technology really is. What I saw, nevertheless, was nothing short of stunning. The brightest pixels almost seemed to cast shadows on the blackest blacks, producing one of the most realistic pictures I’ve ever seen. The only thing that came close to matching the Sony prototype’s crystal-clear picture was yet another prototype, this time from Sharp. This smaller, 27-inch display boasts a pixel-density that’s higher than that of an iPhone 8 and produces an almost photo-realistic effect. It didn’t matter how close I got my eyeballs to the screen, I couldn’t see individual pixels. What I could see was the tiniest movement and detail with shocking clarity. While Sharp said that it’s still working on plans to bring this display to market, it would likely only come in small sizes and be targeted at the prosumer market for things like photo and video editing. Sharp still seems like it’s ahead of the game in terms of building 8K TVs for consumers. The company became the first to start selling 8K TVs last August in Asia and Europe and now plans to start not only sales but also manufacturing in the United States. Remember that big Foxconn plant being built in Wisconsin? 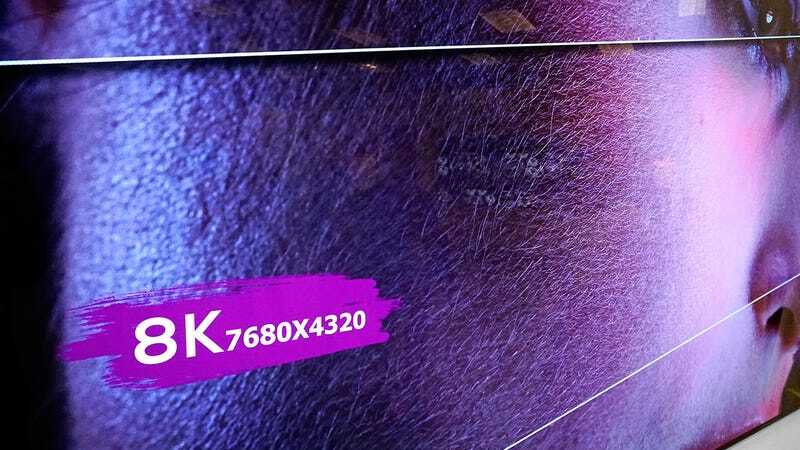 8K displays is one of the things it will be producing. Meanwhile, the 70- and 85-inch 8K displays the company showed off at CES will be available in the US later this year. That leaves us with LG and Samsung. Both of these market leaders are experimenting with 8K technology in their own ways. LG is doing its classic let’s-make-a-big-beautiful-OLED routine and showed an 88-inch 8K prototype at CES. There’s no word if or when you might be able to buy this TV. Samsung, for its part, actually stopped short of showing an 8K TV at CES, instead announcing plans for a new line of displays that uses artificial intelligence to upscale 4K content so that it kinda sorta looks like 8K content. Nice idea, but still, it’s not the real thing. At the end of the day, this is only the beginning for 8K TVs. Next year’s CES will undoubtedly have even more prototypes and, hopefully, more 8K TVs you’ll actually be able to buy. If you’re dying to take a trip into the uncanny valley, though, try and find a way to see these screens in person. They look too real, too good, and too tempting to wait another year for.